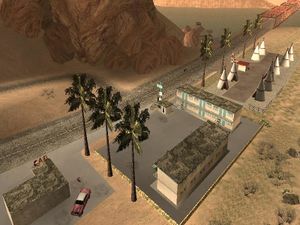 Valle Ocultado is the smallest functioning municipality in San Andreas. Its name translates from Spanish as Hidden Valley. It is located in the northwestern tip of Bone County, at the foot of the bridge leading into Tierra Robada to the west, and just north of Arco del Oeste. This tiny community consists of two motels, an establishment with a sign reading "GAS", and a boat station. Nearby areas include Sherman Dam, Sherman Reservoir, Las Payasadas, and Arco del Oeste. Much like many other rural towns within the county, due to its relatively small size, Valle Ocultado mainly occupies low-rise businesses; a few medium density structures are also present. The Native American and subtle country folk flavor of the vicinity contrasts to the glamour and glitz of Las Venturas, only a few miles away. No gangs occupy the area as of 1992, while the crime rate is very low, giving the town a much more positive reputation, unlike those of Glen Park and East Los Santos, where crime persists daily. The architecture of the vicinity is not so spectacular though better than most rural towns of its kind, consisting of unique Tee Pee structures and average small hotels. The name of the town, Valle Ocultado, translates into English as "hidden valley". This may be a reference to Hidden Valley Ranch, a popular brand of ranch dressing in the United States. This page was last modified on 15 March 2015, at 03:26.